coordinated and consistent in-hospital ordering and management to improve transparency of product inventory, ensure that product is provided to approved patients only and to reduce expiry related wastage. 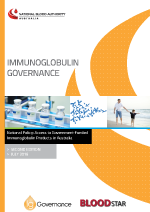 The policy should be read in conjunction with the Criteria for the clinical use of immunoglobulin in Australia . The policy was first released in 2014 and revised for the BloodSTAR  release in 2016.